JMP Australia can now offer a complete range of line-shaft conveying options. Among their products are turn-key stations and single conveyors. Line-shaft conveying systems are an adaptable and economic solution for transporting a range of products. An important feature of line-shaft conveyors is the drive mechanism. This consists of a motor gearbox which is mounted under the conveyor frame and drives a continuous shaft. Drive spools, fitted along the length of the conveyor, provide the force to the rollers via polyurethane drive bands. Materials used on conveyor frame and roller are dependent on environment. Typically powder-coated mild steel conveyor frames are matched with galvanised rollers and stainless steel frames are matched with either stainless steel or PVC rollers. 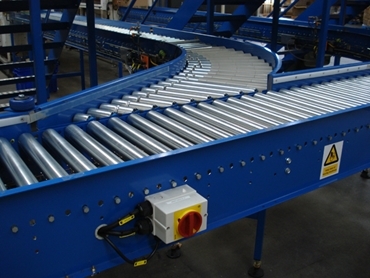 All line conveyors include fitted plastic line shaft guards as an added safety feature. JMP Australia’s line-shaft conveyor range includes modules such as, merges, diverts, drop-stops, chain driven transfers, bends, pneumatic pushers, pneumatic blade stops, line brakes and personnel gates. JMP’s line-shaft conveyors are available stand-alone or as a part of a turn-key system. Examples are the robotic palletising and packing systems. The company also offers services, including installation, commissioning and project management for larger systems.